Height adjustable legs - 16" to 21"
30" x 17" x 7.5"
Adapts Easily for Left or Right Hand Showers! 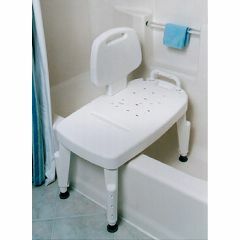 Bath + Safe Adjustable Transfer Bench provides easier access for people who have difficulty getting in and out of the shower. Features height adjustable legs (16-21"), removable back and arm, built-in hand held shower holder and suction feet. Overall width is 30". Supports up to 350lbs. Easy to assemble. No tools required. Durable and rust proof. Did not fit tub properly. Unable to exchange. Disabled. Donated to Good Will. Could NOT use due to size of tub. by Rocket from Suburban Phila. Easy To Install. Lightweight. Sturdy. Safe. Functional. by Finaly showering in from Durham,N.C. Provides safe access to the tub and shower. Good quality and features for the money. Yes, the legs have suction cups on all 4 legs. The clients for whom I have ordered these benches love them and say using the bench has greatly improved their ability to assist their loved one in the shower. I have not personnally observed them in use. Not without major damage, at least that's what happened to me. The instructions say that the legs were not made to be removed. The height of the bench can be adjusted, each leg moving independantly. What is the function of the slot on the opposite side of the arm?